What’s a birthday party without a little bit of diabetes crazy? Benny turned 8 in late December, but because of winter break and vacations we always have his party in January. This year it was Great Wolf Lodge. 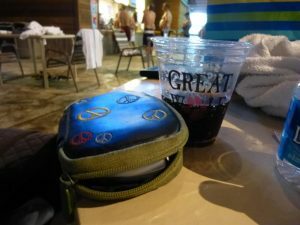 If you haven’t been, GWL is a hotel and conference center with a huge indoor water park and tons of other fun for kids. Our group was having a soaking-wet blast until Benny started feeling tired and lousy. Of course he was low (67) and of course I’d accidentally sent the bag with the juice boxes up to our room. I did have some fruit gushers (with liquid centers) but Benny said he didn’t want them. Uh-oh. This kid doesn’t turn down candy. I’m sure only a few minutes went by, but it felt like forever. Please, please drink the stupid Coke! Finally, I got him to take a sip. Then another. He held it with shaking hands and asked, “Can I have this AND the Gushers?” Whew. That’s when I knew it was going to be okay. The kids went back to the wave pool and water slide. The only other glitch happened when the inset came out just before we were ready to go up to our room for pizza. But Benny decided it would be cool to show his friends how it works. It was great; the kids couldn’t believe how big the needle is and that Benny didn’t scream when it went in. Tough guy. Then it was back to talking about what 8, 9 and ten year old boys like. Football, pizza, Gangnum style (yes, still) and Minecraft. They ran around like maniacs at the arcade and we went over-time at the waterpark. The next day I asked Benny what he was thinking when he wouldn’t drink the Coke. He said he felt like his blood sugar was actually really high and that he didn’t need to eat; he felt full. I must have looked confused, because he just shook his head and said it was hard to explain. I didn’t push. He’s a year older, but he’s still only eight. And after six years of type 1, we’re still figuring some things out.